Is your Facebook feed full of people running round in giant bubbles, playing a strange, sci-fi game of football? If not, it may well be soon, as we've noticed an increase in places to play bubble football in London. Well, we like to be on the ball (sorry) when it comes to these things. If you fancy getting beaten up en masse by your mates, here are your options for playing bubble football in London. Sadly it doesn't seem widespread enough yet to have drop-in games, or teams to join (if you know differently, let us know in the comments), so it's a case of hiring out a whole match for a birthday party, stag or hen do, office away day, or afternoon of general merriment. This company seems to be the leader in London-based bubble fun at the moment. Its main venues are surprisingly central — in Waterloo, the City and a little further out in Barnes. Packages include venue and equipment hire, and prices start from £320 for 10 people for up to an hour (recommended for a taster session if you've never done it before). If you're feeling braver, play for up to 90 mins for £380 for 10 players. Additional players can be added to each package for an extra fee. With two venues, in Greenwich and Dartford, Bubble Football Events seems to offer the easiest option for small groups, with a minimum of six people required to participate in the Friday night session at London Soccer Dome in Greenwich (£20 per person). 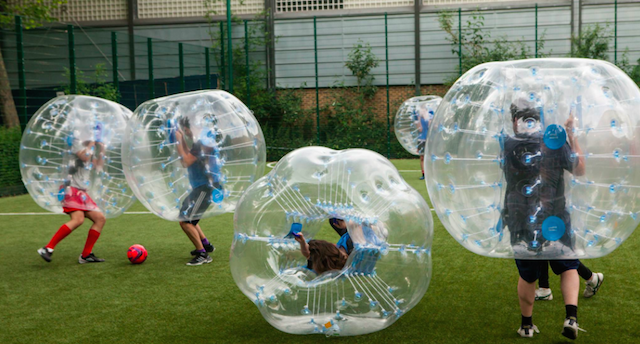 Zorbing Hire offers bubble football at a few venues across London and Essex, including Shoreditch and Old Street. These venues start at £375 for an hour (up to 20 people) or £475 for 90 minutes (up to 40 people). If you can round up enough people, it works out at a little over £10 each — cheaper than a night at the cinema. Predictably, the further out of the centre you go, the cheaper it gets. If you happen to have a football pitch or sports hall at your disposal, plenty of companies offer the option of bringing their equipment and know-how to you. Zorball offers the choice of including a venue or not, and starts from £300 for up to 20 players. They provide the option of adding a video to your package, allowing you to relive your victory/shame at a later date. They do children's parties too (protective parents need not apply). excel Bubble Football offers hire of the bubbles and goalposts for £20 per player, but is unable to provide a venue, unless you opt for the stag/hen do package. Know of anywhere else in London that you can play bubble football, or more importantly, have you tried it? Let us know in the comments below. Like this? Find our where you can do other extreme sports in London.